Eric O’Grey was told he only had five years left to live in 2010. After a flight was delayed because the airline attendant couldn’t get him in the seat belt extensions, O’Grey decided to make a change. That change included an “obese, middle-aged” rescue dog named Peety, who was left neglected and alone in a backyard. “He’d gone from being in a situation like I was, where he didn’t have any friends and he didn’t know anybody, and really became a proud dog,” he said. 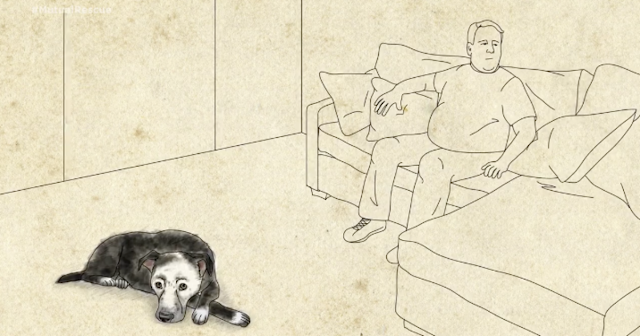 Daily walks with Peety and better nutrition helped O’Grey lose 140 pounds. Although Peety has, sadly, since died of cancer, O’Grey has adopted another dog named Jake, who he is going to run a half marathon with. But he will be grateful for Peety forever. "Mutual Rescue is an initiative that aims to change the way people see animal welfare. By sharing stories about connecting a person with an animal, Mutual Rescue hopes to demonstrate that when you support your local animal shelter, you’re not just enhancing an animal’s life—you’re also transforming a person’s life as well. The stories shared by everyday people through Mutual Rescue are testaments to the incredible impact that an animal and a person have on each other, and that “rescuing” isn’t in just one direction."